Friends S3:E4 – “There’s got to be a better way!” Turning to my Amazing Discoveries co-host, “Wow. That’s really profound and topical, Kevin. After watching that debate last night, I think you’re flingin’-flangin’ right.” Hey there, everybody. Have you caught your breath from witnessing Donald Trump’s attempt to drag the entire country through the mud last night? Speaking of amazing discoveries, Trump’s Access Hollywood video, tho. Now that’s what I call an October surprise. On second thought, strike that. Is Trump bragging about he can get away with sexually assaulting women because he’s a celebrity really an amazing discovery? Isn’t that really par for the course at this point? I mean wouldn’t the real October surprise have been if a tape like this hadn’t been leaked less than 30 days before the election? 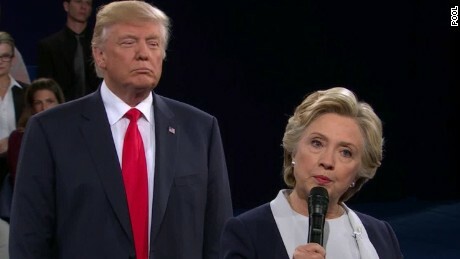 Are you really going to watch the way this bumbling bully lurked over Secretary Clinton’s shoulder as she was addressing voters last night during the debate and still try to convince me that America’s most famous racist narcissist doesn’t also have a penchant for chauvinism? Regardless of whether Trump’s offensive tape was an amazing discovery or simply par for the course for the least qualified presidential candidate in American history, I’m glad it’s out there and working to diminish his chances of winning the election. Of course Trump’s reaction to the latest scandal was predictably to try and pull Bill and Hillary Clinton down in the gutter with him in by deploying a scorched earth strategy. He may have effectively rallied his base with that strategy, but I think for most reasonable Americans…the damage is done. It should be crystal clear by now that this is not a hard choice. Bottom line: voting for Donald Trump is flat out irresponsible. Anybody who thinks about this election rationally and soberly understands that Hillary Clinton is the only choice. That being said, I think Democrats are on shaking ground trying to present Hillary Clinton as the moral authority in this race. There is no question that she and Former President Clinton have also had moral shortcomings in their careers and it is because of those moral shortcoming that the “vast right-wing conspiracy” is able to generate the fuel it needs to allow Donald Trump to hang around and still have an outside shot at becoming President of the United States. If the Democratic Party wanted to be the moral authority in this election in order to obliterate Trump’s candidacy (and take back the Senate, the House, and a few state houses in the process) there was a candidate in the race we could have nominated. That candidate was Bernie Sanders. Can you imagine how differently the second debate would have gone if Trump was going up against Bernie Sanders’ moral leadership instead of being able to grab on to the Clinton’s shortcomings and drag them down in the gutter with him? The Republican establishment has a lot of soul searching to do for allowing someone as utterly unacceptable as Donald Trump to become their party’s nominee but the Democratic establishment has a lot of soul searching to do as well for insisting on running a flawed candidate against him and subsequently tipping the scales in the primary to ensure their desired outcome. The sky would have been the limit on the amount of progressive change we could have ushered in in the first 100 days of a Bernie Sanders presidency if his political revolution had been given the opportunity to clean Trump’s clock and wipe out Republican majorities up and down the ballot. Bernie’s new age New Deal governing could have made a real difference in the lives of working families and perhaps given us one last crack at doing something meaningful to address climate change before it’s too late. Sadly, this vision for a new era of progressivism is just conjecture. Sure, I’m voting for Hillary Clinton because she is the only responsible choice. At the same time, I will never forgive the Democratic establishment for tipping the scales in the 2016 primaries and squandering a once in a generation opportunity (putting us at risk of a Trump presidency in the process). And I will never forget. Won’t you dance around with me? Oh man, my Friends heart is filled with joy after reliving that classic Ross moment. If this election has got you worried, stressed, or angry just remember to pull out your metaphorical Milk Master 2000, think about Ross hosting tea parties as his alter ego, Bea and then tell yourself, “Now I can have milk every day!” Until next week…stay thirsty, my fans of Friends. Recap in the Key of Phoebe – This is the one where Chandler goes all Chandler and gives in to his fear of commitment but then allows Monica and Rachel to convince him to overcompensate and scare Janice away, Ross has trouble adjusting to the news that Barbie is Ben’s favorite toy, Phoebe forgets to give Joey a message about an audition and then pretends to be his agent to make up for it, and (despite his obsessive behavior) Janice still calls Chandler back which is an amazing discovery for Monica and Rachel because in their experience…a man would never call back if they had acted in a relationship the way Chandler had with Janice. Ugly Naked Guy Watch – Rachel is at her place with Ross and notices (while walking by with a laundry basket) that Ugly Naked Guy is still naked but that his dog is wearing a sweater.